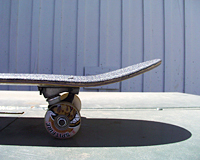 wheels to the board, and allow the board to turn. and gives the rider more control of the board. The rest of the shape is called the 'Plan Form' or the 'Boards Outline'. Nose: the front of the skateboard.